• Want your colour to shine? This exclusive formula, with Vitamin E and Keratin, plays on 2 levels. 2. It nourishes your hair to keep it shiny. 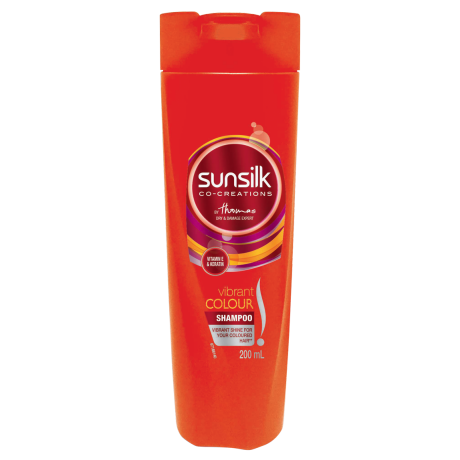 Sunsilk Vibrant Colour Shampoo 200ml Vibrant shine for your coloured hair** **With use of shampoo and conditioner vs non-conditioning shampoo. Ready? Massage onto wet hair and then rinse thoroughly. Repeat application and use daily. For even more incredible hair, why not combine it with Sunsilk Vibrant Colour Conditioner? Water, Sodium Laureth Sulfate/Sodium C12-13 Pareth Sulfate*, Cocamidopropyl Betaine, Dimethiconol, Hydrolysed Keratin, Ethylhexyl Methoxycinnamate, Tocopheryl Acetate, Peg-45M, Carbomer, Guar Hydroxypropyltrimonium Chloride, Tea-Dodecylbenzenesulfonate, Tea-Sulfate, Cyclotetrasiloxane, Synthetic Fluorphlogophite, Tin Oxide, Sodium Chloride, Citric Acid, Disodium Edta, Sodium Benzoate, Phenoxyethanol, Fragrance, Ci 77891, Ci 47005, Ci 16255. *Used Interchangeably.